By chance a research group at Cornell University discovered that white blood cells known as neutrophils stick to the smallest blood vessels in the human body (called capillaries) and reduce blood flow to the brain. Unblocking these capillaries with a monoclonal antibody (antibody blockers) that prevent the adhesion of roaming neutrophils to capillary walls improves blood flow in the brain. An immediate restoration of mental performance and working memory of laboratory animals was observed. The discovery has profound application among adults who face age-related memory decline. The ground-breaking report was published in the journal Nature Neuroscience. While researchers are still scratching their heads how to remedy the problem and are reported to be reviewing some 20 drugs that may have therapeutic potential, since 1998 it has been reported that the red wine molecule resveratrol inhibits adhesion of neutrophils even at very low concentrations. The effect of resveratrol is more demonstrative when accompanied by other similar molecules, as found in grapes and concentrated wine fermented wine or provided in a matrix of red wine molecules. Once neutrophils are activated they can stimulate blood platelets to produce clots that further impair circulation. (Blood platelets are what facilitate clotting necessary to seal open wounds.) The platelet-neutrophil aggregation problem runs parallel with the elevation of circulating levels of cholesterol. Vascular (blood vessel) surgeons have difficulty storing vein grafts for surgical implantation. Adhesion molecules induce neutrophils to adhere to the inside of these vein grafts. Storage of vein grafts in resveratrol has been demonstrated to inhibit this problem. Of particular interest is that only active trans-resveratrol has been demonstrated to inhibit the adhesion of white blood cells, not the inactive cis-resveratrol. Exposure to light, in particular UV light, degrades trans-resveratrol to cis resveratrol. 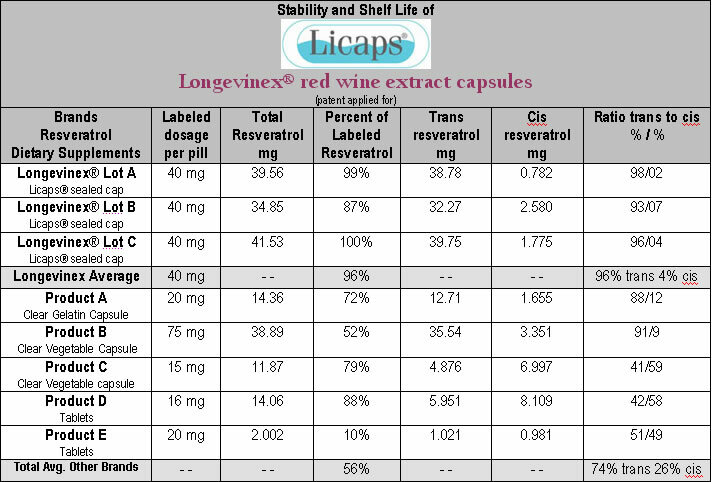 Laboratories do not test for cis resveratrol in resveratrol dietary supplements. A few years back a study revealed considerable degradation of trans to cis resveratrol in resveratrol dietary supplements that are not protected from light, heat and oxygen. One brand (LongevinexÒ) microencapsulates to enfold resveratrol in protective plant starches and dextrins, encapsulates in an opaque shell and packages in foil sealed blister packs to ensure the delivery of research-grade trans resveratrol. According to a survey conducted by 3M Company, maker of Post-It Notes, adults forget four “things” on average every day. That amounts to 1,460 memory lapses a year. Memories fade with advancing age. Forgetting where we placed a cell phone is common. Why we walked into a room, where you parked your car, problems recalling a frequently-used phone number, a bill you forgot to pay, along with forgotten birthdays and anniversaries are the most commonly mentioned memory lapses reported.